Cue scary self-imposed writing assignment. When I started this blog, I thought it would be a great place to catalog my creative musings, my challenges, my inspirations, and my understanding of the writing process as I experience it. I am a writer who is not writing. These past 26 posts have therefore been a surreptitious journey of self-discovery, or as I now like to call it: throw everything against the wall and see what sticks. My secret hope, I think, was that if I could publicly display my inner sanctum of creative wrestlings, then maybe, just maybe, I could hold myself accountable long enough to actually finish writing…something. So, out on the wall has gone my list of three, my heroes, my mentors, my places of inspiration, my strategies – each a perfectly valid ingredient of my creative process. Except for the idea that I am sort of fooling myself. Because every post is really just dancing around the issue. The main issue. The one issue. The only issue. As a writer, I am struggling with more than just time crunches and inspiration wells. There are more barriers to my creative output than just figuring out when I can actually sit down and write or what to write about. My struggle, as I’ve mentioned, is actually how to keep going. But, more truthfully (insert deep breath here), my real struggle is why I should keep going. Yes, I mean why on a rather large, rather dark, sort of scale. We seem to understand each other better these days. Maybe it’s because I’m stalking him. I don’t know. I don’t have malicious intentions. I just want to know him better. Sometimes, we sit next to each other at Starbucks. We don’t say much, just sip our coffee and share space. “How do I fit?” he asks. It’s true. Death knows me well. Someone said to me recently that it is necessary go into the dark places so your light can shine brighter. While this may sound cliché (and a little bit like science! 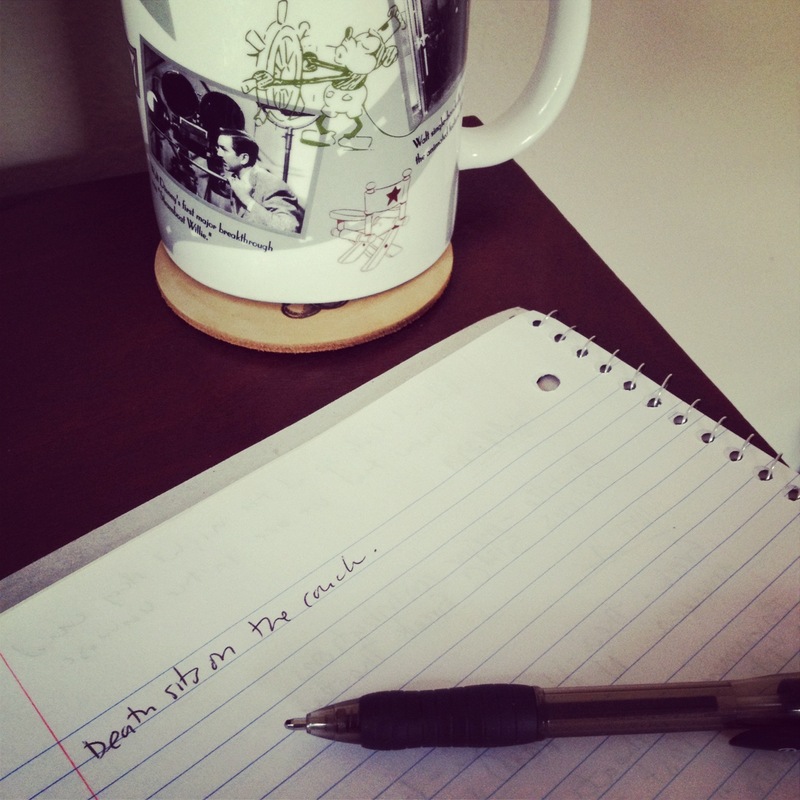 ), it has lately become an insistent and overwhelming theme in my own morning pages: “Write them out! Write out the dark spots!” my pink handwriting scolds me over coffee and strains of Josh Groban. So, okay, maybe there are some shadowy places, but even so, no one wants to hear about that. Not my parents, not my friends, not Smile Scavenger, not the anonymous readers out there in the blogo-dark. This blog is supposed to be at least 10% inspiring. How inspiring could discussing that possibly be? If I really want to get to the bottom of why I’m not writing, I have to address this. As scary as it may be to say aloud, the truth of my unwritten-ness lies in these dark spots, the ones we don’t talk about at parties, as Col. Jessup says. But more so, the truth of my actual writing is that it is always about this darkness, whether I like it or not. Because in not acknowledging it, everything I produce is merely an avoidance of it. This avoidance, even unconsciously, colors every word I write, makes me less truthful on the page, and severely limits any skill I may possess. Sooner or later, if I am going to continue on this particular path, I have to face these demons. And, unfortunately, I can’t fake them out with fairy dust and glitter bombs. Or year-round Christmas music, for that matter. I find Death in the bedroom where he is hanging curtains. Death doesn’t stop what he is doing, but he looks over his shoulder and watches me, my head bowed in concentration, spinning through my iPod playlists. “I like Christmas,” Death says. He goes back to hanging the curtains. “But what about the music?” I persist, looking up at him. Death stops hanging the curtains. He turns around. “Why are you asking me about Christmas?” He is stern. “I just want to know,” I reply. “Do you like Christmas music?” he asks. “Then why am I here?” Death asks. I stare at Death for a moment and then I leave the room quickly, cheeks burning. Shut up, Death, I think. What do you know? So, what are those demons, exactly? It’s a valid question. I don’t have an answer. All I know is that they come, fast and furious, swooping into my mind and body like shadows of freezing rain. I stop writing. I stop smiling. I wake up in the morning surprised I am still here. Those who know me may be a little surprised at this point that any dark thoughts at all go through my head ever. Those who know me really well are aware of my struggles with questions like “What is the point of all of this?” – struggles that have often left me crying in random places like workplace bathrooms and libraries. As a person, in life, I generally present as happy and life-loving and that is not a lie. But, just like artists who don’t paint and singers who don’t sing and – insert any creative type who doesn’t fulfill her inner calling here – , writers who don’t write are not complete people. And when I’m faced with a blank page, the darkness creeps in so easily. I wonder, if I’m not going to fulfill my potential today, then what am I doing here in the first place? And the more my thoughts spin on these meditations, the more painful it can be just being in my own body. And that’s when the darkness can become…well, really dark. This is hard to write about. From an outside perspective, I understand these feelings as selfish, whiny, and, of course, ones that should not be indulged. More so, this sort of darkest dark has gotten the better of at least one person close to me in my life. I know it as a very scary, very helpless place to be. Nevertheless, there it is. Ever-looming, ever-present, ever-daring me to run past it if I can and actually create something amazeballs. And honestly, sometimes I just don’t have enough energy for the Red Rover. My mother wants to stop in and see my grandmother at her retirement home. I ask if Death can come. She looks at me, smiles awkwardly, and gets into the car. I look at Death and shrug. “That’s okay,” says Death. “You know how I hate that place. Death nods. He goes into the house. After a moment, I hear the sound of the television. I have no idea why exactly, but that day, while I was crying in a library, I decided that instead of trying to write in spite of the darkness, I would instead write about it. “Tiffany, just do your work,” was also something that Susan Aston used to say and, in that moment, that was the only work I could do. I’ve never been sure of anything in my life except that I’m a writer. So, I wrote. Now, it seems like a no-brainer. Then, it was a quiet revelation. Charged with addressing what was in front of me, I began to personify my darkness – the looming, ominous, oppressiveness that holds me prisoner from my own creativity. Eventually, I gave my darkness a name. I called it Death. (Not very creative, I know. Thinking back on it, I probably should have called it Carl, or Albert, or Francois.) 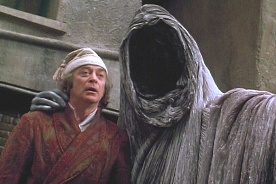 Unshockingly, as I started to describe Death, I couldn’t help but picture The Ghost of Christmas Yet To Come from A Muppet Christmas Carol. Once I had my darkness described, I could start talking with it. My conversations became little poems. And the little poems actually made me laugh. And because I started laughing and stopped snotting on library books, my darkness called Death in that moment didn’t seem so vast and incomprehensible and oppressive. He became sort of a pal. Admittedly, not a very, you know, comforting pal. But a pal, none the less. In this forum, I felt courageous enough to address my feelings and ideas about the darkness that I would not be comfortable talking about with actual people. Because, you know, Death wouldn’t judge me for having dark places. He’s Death. He totally doesn’t care. The more I began to write about my own dark places, the less I became afraid of them, or ashamed of them, or more depressed because they existed in the first place. Instead of passively experiencing them, I could, instead, actively explore them. Within the bubble of my creative work that day, I felt powerful instead of powerless. For the first time ever, I experienced my own writing as transformative. Plus, it cracked me up to think of this large, lurking figure just kicking it with me over mochacinos. “Where’s Death?” my mother asks. I look around. I spot him out back. “He’s out by the pool,” I say. I wander through the sliding glass door. Death sits with his feet dangling in the pool. He is lost in thought, watching the sunlight dance on the clear, chlorinated water. He looks up at me as I approach. “Mom wants to know if you want a sandwich,” I say. There is an awkward pause. Then, I sit down on the hot cement next to him and stick my feet into the cool water. We sit in our familiar shared silence for a moment. Death keeps staring at the deep shimmering water. I watch Death stare at the water. I look down at my feet through the water and swirl them around. I’m not going to lie. It’s extremely uncomfortable to be writing about – let’s call it what it is – depression – in a public forum. I certainly am not presenting any sort of quick fix and even this strategy does not work for me all of the time. But “writing out the dark spots” turned out to be a literal task, and a good one, sort of like cleaning out the corners of a room I was so used to seeing filled with dust that I never realized they didn’t have to be like that. And frankly, it is a relief to admit the stark reality of my own creative blocks, instead of just opening a giant can of whitewash. Sometimes we have to write about things in order to understand them at all. Joan Didion taught me that. Let’s be clear: I do not think that my death stories will be my literary legacy. But, the writing feels – maybe for the first time? – truthful. So, maybe if I “write out the dark spots” for a little while longer, I will understand more fully what it is to write truthfully. Then, maybe, I won’t have to write about the darkness anymore. But, nevertheless, I was right. 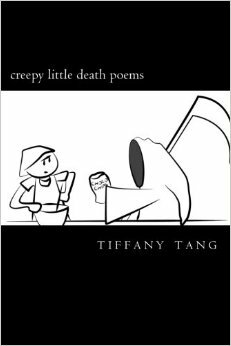 February 2, 2014: Tiffany Tang has since published a volume of ‘creepy little death poems’ due to the overwhelming response to this post.